Two-thousand workers at four Amazon warehouses in Germany have gone on strike until Tuesday in a dispute over pay and working conditions, according to the union Ver.di. The dispute centres on how Amazon classifies its warehouse staff. Ver.di says: "Amazon pays wages which are lower than wages for staff in the retail or mail order trade in Germany". Amazon classifies them as logistics workers and says that their wage is in the "upper end of the scale". 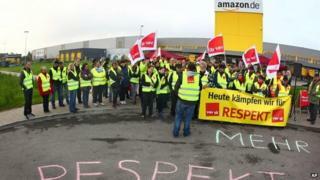 Staff at Amazon's plants at Leipzig, Bad Hersfeld, Graben and Rheinberg will be on strike until Tuesday. Amazon said in a statement: "Ver.di is calling for wages on the basis of a retail tariff. But Amazon's fulfilment centres are not shops frequented by customers. "Staff in our fulfilment centres work within the logistics sector, not retail." Responding to Amazon's comments, a Ver.di spokesperson said: "The work at the fulfilment centre at Amazon is a classical part of the mail-order trade and therefore a classical part of the retail trade. "Amazon's discourse about logistics is only to try to camouflage that Amazon is not willing to accept any collective bargaining agreement at all. "Amazon wants to dictate unilaterally the working conditions, but the employees are not willing to accept that anymore." Ver.di say wages are not comparable to other warehouse staff in the country. Amazon employs more than 9,000 people in Germany. The German market is Amazon's second-biggest market behind the US. Hundreds of Amazon staff walked out during the Christmas period in 2013.